Sometimes, astronomy is a zoo. One of the big problems in recent astronomy is that we're collecting data faster than we can analyze it. This is no joke; modern survey telescopes equipped with digital detectors can generate many gigabytes of data every night. Sweeping across the sky, they look for asteroids, exploding stars, anything that changes from one night to the next. Computers can analyze the data, and in many cases they're pretty good at it. But not at everything. For example, you get an image that, to your eye, has a few hundred faint fuzzy galaxies in it. Your job is to identify the type of galaxy: elliptical, spiral, peculiar, whatever. Better hurry! By tomorrow, you'll have 20 images just like this one, but of different parts of the sky. You think, I'll program my computer to do this! One popular piece of software, called Source Extractor, or (seriously) SExtractor for short, can do a decent job. But it isn't perfect. Sometimes, you just can't beat a human brain (no matter how much you may want to beat the human encasing it). Chris Lintott, a UK astronomer (perhaps better known as the co-host of the beloved program "The Sky at Night") felt the same way (though, one supposes, not about the beatings). He and his team want to categorize thousands, hundreds of thousands of galaxies in the Sloan Digital Sky Survey images (if you think your camera is nice... the Sloan survey uses a 142 megapixel array). Why not open it up to the public, they thought, and let people get it a try? So they created Galaxy Zoo. You sign up, take a brief test to see how well you can identify galaxies (it's fun! ), and if you can get a high enough score, off you go! You are sent a galaxy image (a program looks at all the data and decides if an object is a galaxy or not) and asked if it's an elliptical, a merger (a product of two galaxies colliding), or a spiral. You click the appropriate button, and the next galaxy is automatically served to you. The interface is slick and clean, and they really do give you everything you need. They send the same galaxy to multiple users, and see what kind of consensus they get on the morphology (shape) of the galaxy. I knew right away from the color and the patchy arms that this was a "starburst" galaxy, a galaxy that is undergoing intense amounts of star formation. 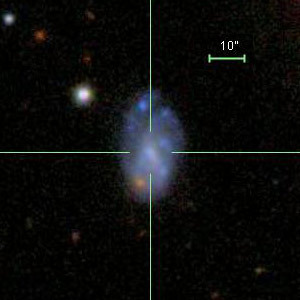 A link was provided on the Galaxy Zoo page to the Sloan catalog page for it, and there was also a spectrum of it. Bang! 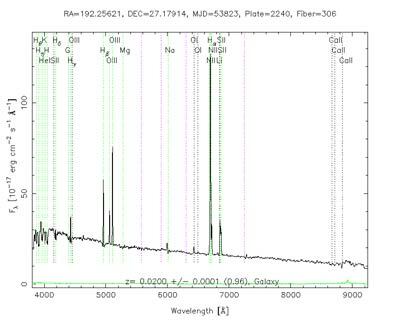 Whopping emission lines from oxygen, hydrogen, and nitrogen, and an overall bluish spectral background. Oh yeah, this baby is popping 'em out. And this was my tenth galaxy to examine! What treasures lie in that data, never before seen? Now's your chance to find out. Go and explore space. Warning: it's addictive. The hardest part is stopping. Tip o' the Sombrero (hahahahaha!) to Chris Lintott and Dave P.